Dr. 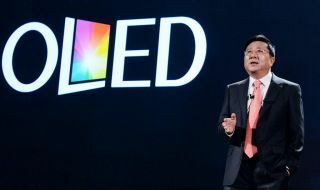 Sang Beom Han, CEO and President of LG Display, said that OLED represents a revolutionary leap in display technology that will change people’s lives as he delivered the opening keynote speech at IFA 2015 in Berlin on September 4. Displays are becoming increasingly important as their application expands beyond consumer electronics and IT/mobile devices to cars, hospitals and schools. “We want OLED to be the revolution of light that opens up the future we all want to live in,” said Dr. Han, the first display industry CEO to deliver the opening IFA keynote address. Dr. Han told the audience that OLED is the only technology that overcomes the limitations of conventional displays because it offers enhanced reality combined with dynamic form. OLED offers superior light and color expression because it is based on self-emitting light sources. Its flexibility and transparent nature are the result of the development of OLED materials. Dr. Han said that LG Display’s research development is focused on delivering value to customers that cannot be achieved with conventional displays. OLED displays can be used in a number of future applications from wearables and fashion to home furnishings and room designs. In addition, Sir Ridley Scott, the acclaimed film director, said in a film segment of the keynote presentation that OLED TV is the first display technology that shows perfect black, which creates a sharp color contrast that fully delivers the picture quality that he envisions in making his movies. “I think this is a game-changer, and I’m happy to say that I would love to have all my films viewed on the revolutionary OLED TV,” he added. Dr. Han said the company is proud in achieving the goal of making a display that realizes people’s imagination and dreams. He predicted that OLED has a bright future because of the convergence of different technology sectors, with the participation of outside partners benefiting from OLED’s growth. LG Display presented OLED prototypes at IFA keynote event. The company introduced a 111-inch “wave” double-sided display(Vertical Tiling OLED), made out of three attached 65-inch Ultra HD OLED displays.LG Display also showed a 55-inch double-sided commercial display with a thickness of approximately 5.3mm, which is thinner than the latest smartphone, and weighing 12 kilograms. In addition, the company presented a 55-inch “wallpaper” OLED display with a thickness of less than 1 millimeter that can instantly be attached to and removed from walls because of its magnetic backing.